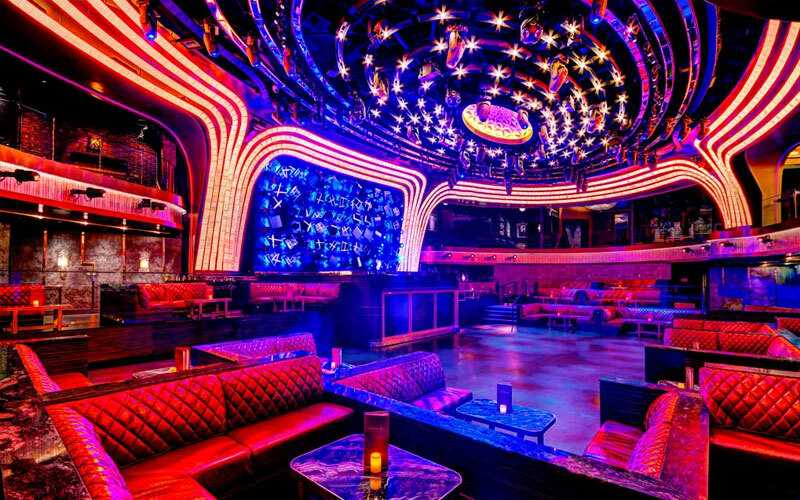 Jewel Nightclub Las Vegas is night club in Las Vegas NV at the Aria Hotel & Casino that opened May 19th, 2016. This venue is formerly known as Haze closed in November 2014 was sold by MGM Resorts International to the Hakkasan Group in 2015. This 24,000 square foot property was designed by the David Rockwell Group of New York, and holds a capacity of 1,923. There are 47 VIP table location in total with a 36 on the first floor main club, and 11 on the Mezzanine balcony level that include 5 VIP themed Skybox suites that circle the parameter of the railing that overlooks the dancefloor. The Hakkasan Group treated this venue just as serious during the design and development by spending as much money per square inch as they did on their larger properties Light, Hakkasan, and Omnia. The goal for this project was to create an unparalleled experience, while implementing seamless technology integration that would be strong enough to capture the attention of the market on the property to be utilized by hotel guests, casino gamblers, T-Mobile Arena attendees, as well as the multiple restaurants, lounges, and bars on the facility. Jewel Nightclub Las Vegas is the newest Night Club in Las Vegas NV in 2016. The Hakkasan Group delivers 3 sources of entertainment to its guests including open format resident & top tier DJs, live performances, and celebrities to host their events. 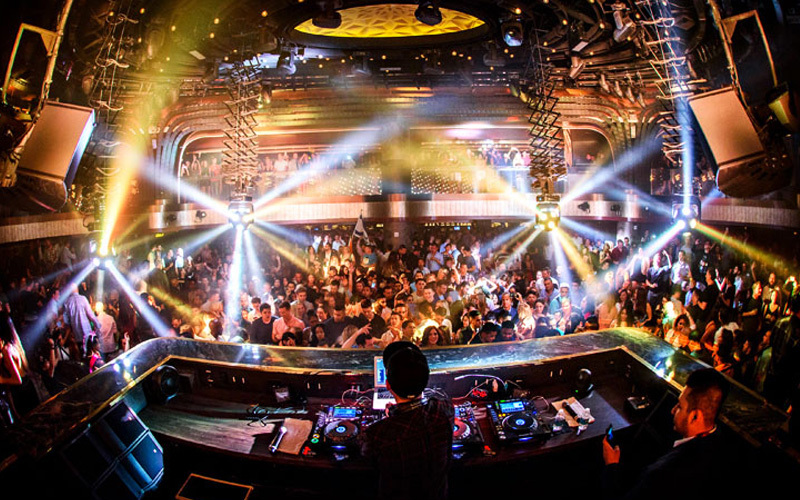 This venue was built with a little something for everyone regarding its architectural layout that would provide enough space in the general admission which includes the dance floors and bar areas where customer feel like they are not being flushed out by the VIPs on the main club or Mezzanine balcony level. Both levels have their own main bars and dance floor areas for general admission attendees to take advantage. When is Jewel Nightclub Las Vegas open? This night club in Las Vegas NV is open Monday, Thursday, Friday, and Saturday from 10:30PM to 4:00AM. Where is Jewel Nightclub Las Vegas located? The location of this night club in Las Vegas NV is in the Aria Hotel and Casino where the former Haze Nightclub use to occupy. How long do I have to wait in line at Jewel Nightclub Las Vegas? 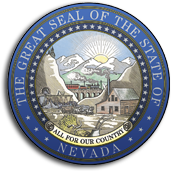 Line waiting times in this night club in Las Vegas NV take approximately 25 minutes to 1hr ½ depending on the time, day of the week, holiday, and performing talent. The line for bottle service will expedite the wait time significantly compared to the General Admission and Presale Ticket line. How much is the cover charge at Jewel Nightclub Las Vegas? What is the dress code in Jewel Nightclub Las Vegas? Dress code at this night club in Las Vegas NV has a strict policy that requires men to wear up upscale attire including collared shirts for men. Hats are not allowed, neither are sandals, or boots. Do not expect to get in wearing sunglasses, and baggy or ripped clothing. Shorts, wife beaters, athletic apparel, and excessive jewelry will prevent you from entering as well. This is a 5 star venue that follows a strict dress code in order to maintain target client expectation levels, so make sure you are dresses to impress. What are the 3 entrances at Jewel Nightclub Las Vegas? The 3 entrances in this night club in Las Vegas NV are for Presale Tickets, General Admission, and VIP bottle service reservations. General Admission guests with make their way into the venue through multiple tall mirrored doors that and the crafted in a way to create a reflective wall effects when the doors get shut. The General Admission guests will then pass through a digital staircase that is comprised of strips of LED screens on entrance framing, and on the staircase step rises that feature various digital display themes. If you made table reservations for bottle service you will enter the club through the VIP entrance. The VIP entrance allows you to enter through a bronze walkway that features vintage glass chandeliers that sparkles from above while leading the guest inside through the first sights of the main club. What type of music do they play in Jewel Nightclub Las Vegas? 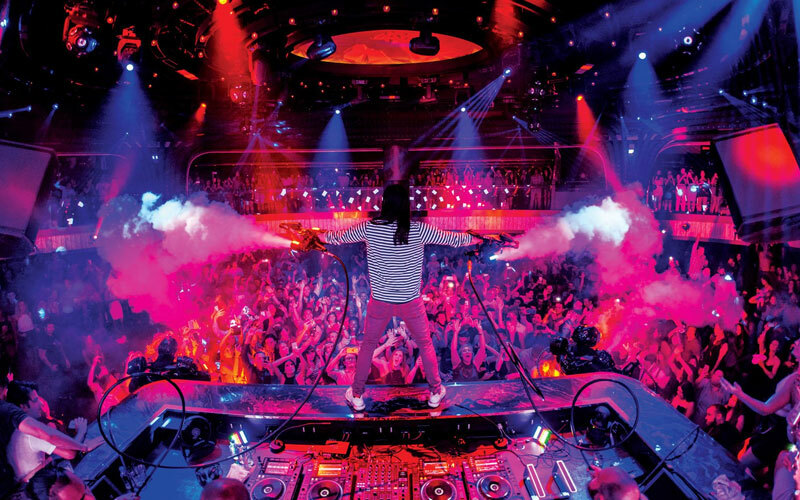 Music genres at this night club in Las Vegas NV are mostly EDM, but also features live Hip Hop performances by talent such as Lil Jon, Jamie Foxx, Iggy Azalea, Swizz Beatz. There is something for everyone whether its EDM, Hip Hop, or Top 40. Just make sure you check the event tickets page. 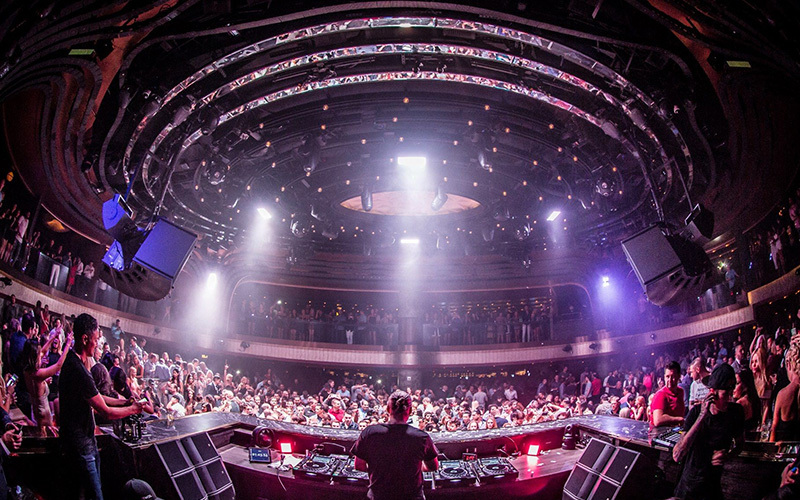 Who are the resident DJs at Jewel Nightclub Las Vegas? Resident DJs in this night club in Las Vegas NV in the Spring and Summer of 2016 includes Steve Aoki, Lil John, Steve Aoki, The Chainsmokers, GTA, Swizz Buzz, and Iggy Azalea. Past 2016 DJ performances include Tiesto, Steve Angelo, Oliver Helden, Ingroso, Jamie Foxx, 3Lau, Dada Life, Borgeous, Jason Derulo, Jauz, and Nervo. What is the digital LED staircase at Jewel Nightclub Las Vegas? This night club in Las Vegas NV hired Ottawa Canada’s UTG Digital Media owned by Alan Wehbe to install the LED staircase which happens to be the first installation of its type to hit the Las Vegas nightclub industry. There is thousands of shock-absorbent LED ribbons on the staircase that can be programmed in real time, and deliver contemporary eclectic visual content such as images, video and text display features in combination. The LED ribbons are integrated seamlessly providing a sharp and edgy elegant design look. The project incorporated custom cabinet design built by UTG Digital Media who constructed a high quality frame provides complete stability. The wiring installation is then attached to the frame, and then the LED modules are attached to the cabinets by means of magnetic reinforcement. To create the LED stairs, the first thing to be done is to disassemble the front panels of each of the individual risers, and then install the LED ribbons across the risers. The treads of the steps are left alone, and then transparent plexi-glass is attached to the treads and risers to create a protective layer from the foot traffic that passes through. The are 2 LED staircases with one at the VIP entrance and one on the Main Club Level that leads up the Mezzanine Balcony Level. What is the main club level in Jewel Nightclub Las Vegas? The main club level in this night club in Las Vegas NV is on the first floor of the venue that is under a domed ceiling which is the center focal point of the room. The walls are covered in handcrafted antique vintage artwork and are accented vintage parquet wood pattern designs. The performance space is smaller compared to other clubs, but provides an intimate up close in person experience for just about every person in the room with the performing talent. The VIP sections have banquets that are made from granite, and the seating is made from upholstered red leather that surrounds the dance floor. The dance floor is smaller but provides enough space to move around. The main club level also has a second LED staircase that leads to the upstairs Mezzanine Balcony Level. 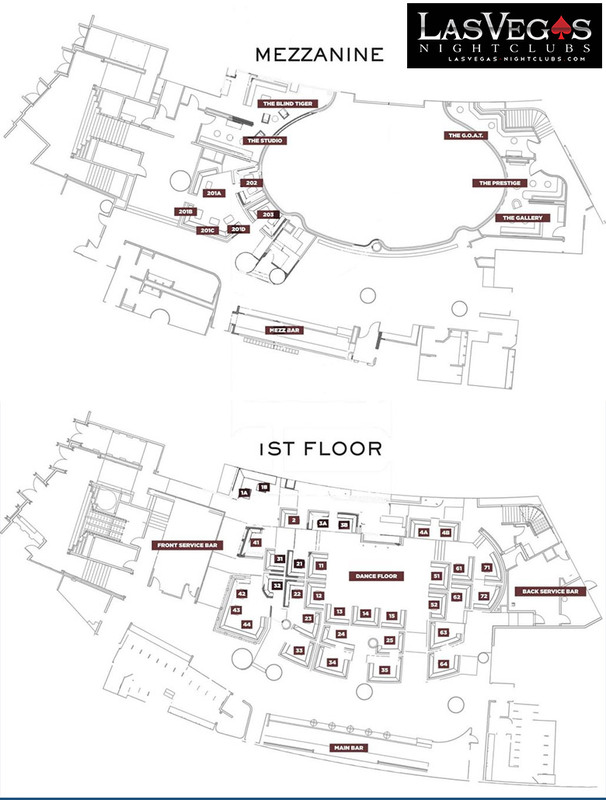 What are the main club level VIP Table locations in Jewel Nightclub Las Vegas? The main club level in this night club in Las Vegas NV has 36 VIP table locations including Dance Floor, Owners Suite, Stage, 2nd Tier, 3rd Tier tables, and Sky Box Suites. What are the 3 main club bars in Jewel Nightclub Las Vegas? 3 main club bars in this night club in Las Vegas NV exist with ones behind the dance floor at the opposite end of the dj booth. The main bar in the main club; constructed from granite, and herringbone patterned wood. This oversized contemporary bar is built with an industrialized design. There are 2 more additional bars on the main club level. The front service bar is located to left of the dance floor if you are facing the stage, and the back service bar is located to the far right of the dance floor is you are facing the stage. What is the Mezzanine Balcony Level at Jewel Nightclub Las Vegas? The mezzanine balcony in this night club in Las Vegas NV is accessed on the Main Club Floor by means of the LED staircase that displays digital graphics on the step raisers like at the front VIP Entrance. The Mezzanine Balcony Level has 11 VIP table locations that include 5 themed Skybox suites, and 6 VIP tables that wrap around that parameter of the railing overlooking the crowd and dance floor on the Main Club Level. The Mezzanine Balcony Level has enough space for general admission attendees to roam around including the bar area, and a dance floor. What are the 5 VIP Skybox Suites on the Mezzanine in Jewel Nightclub Las Vegas? 5 VIP skybox suites in this night club in Las Vegas NV include The G.O.A.T., The Gallery, The Blind Tiger, The Prestige, and The Studio where each has their own private entrance. The 5 Skybox Suites wrap around the parameter of the Mezzanine Balcony level, and each of the Skybox suite themes are completely different from one another, but share the same dark patterned ceiling, porcelain flooring, and can be combined to accommodate large groups. What are the 6 VIP Balcony tables on the Mezzanine in Jewel Nightclub Las Vegas? 6 VIP balcony tables in this night club in Las Vegas NV are found on the Mezzanine Balcony Level including 2 tables (#202 & #203) that at are positioned against the balcony railing. The other 4 VIP tables (#201D, #201A, #201C, and #201B) are connected in a circle just behind 2 tables on the balcony railing. The 6 VIP tables are on the left side of the Mezzanine Balcony right in front of the dance floor, next to the Studio, and directly across from the Gallery. What is the G.O.A.T. Skybox suite in Jewel Nightclub Las Vegas? G.O.A.T. skybox suite in this night club in Las Vegas NV is on the Mezzanine Balcony Level which is abbreviated for Greatest of All Time and must be entered though a vault door that leads its guests into a red brick walled room, 3 bottle service tables, blue suede elongated sofa seating, and porcelain floors. The G.O.A.T., has sports memorabilia including baseball stadium seats, framed baseball jerseys from the New York Yankees, Boston Red Sox, as well as signed basketball jerseys from athletes like #34 Ray Allen, and #23 Michael Jordan. The G.O.A.T. also features recreated artwork from some of the most memorable moments in sports history. This Skybox suite is just above the DJ booth facing The Blind Tiger and The Studio directly across the Mezzanine balcony railing. What is the Blind Tiger Skybox suite in Jewel Nightclub Las Vegas? Blind tiger skybox suite in this night club in Las Vegas NV is on the Mezzanine Balcony Level, which resembles a modern day speakeasy which is also referred to as a Blind Pig. Guests will enter this Skybox suite through an incognito etched wooden Armoire passageway. The Blind Tiger has walls that are made from dark wood, and rustic red bricks. There is a vintage wraparound brown leather sectional sofa, glossy brown coffee table, end table, 5 oversized mirrors, porcelain flooring, and an amber lighting scheme. The Blind Tiger also features a 65 inch flat screen television that is mounted in the center of the red brick wall behind the leather sofa. The Bling Tiger is on the left side of the balcony directly across from the G.O.A.T. What is the Prestige Skybox suite in Jewel Nightclub Las Vegas? Prestige skybox suite in this night club in Las Vegas NV is on the Mezzanine Balcony Level which reminds us of a jewelry box with champagne colored decorations, tufted floor-to-ceiling walls, porcelain floors, and champagne tufted seating that blends quite well with the glowing hues. The Prestige Skybox suite also reminds us about the finer things in life. There is also a chandelier with polished brass beads that dangles from the center of the ceiling. The Prestige is on the right side of the Mezzanine Balcony next to the G.O.A.T. and is directly across from The Studio. What is the Gallery Skybox suite in Jewel Nightclub Las Vegas? Gallery skybox suite in tis night club in Las Vegas NV is on the Mezzanine Balcony Level, which reminds us of a European Salon resembling a small fine art Gallery with over 20 pieces of framed artwork that hang on the red colored walls. The Gallery artwork consists of photography, paintings, and other abstract works of expression. There is porcelain flooring, 2 coffee tables for bottle service, decorative black ceilings, and an L shaped wrap round VIP couch with dark red wine colored leather. This stylish Skybox Suite combines art and nightlife together as one. The Gallery is on the right side of the Mezzanine Balcony next to the Prestige, and is directly across from the 6 VIP tables. What is the Studio Skybox suite in Jewel Nightclub Las Vegas? This night club in Las Vegas NV features the Studio Skybox Suite on the Mezzanine Balcony Level reminds us of a retro recording studio or a retro colored record store featuring vintage record album covers that hang in 3 rows on the aqua blue long walls. The vintage record album pays tribute to some of the most influential names in music history. There is a short wall that is attached to a wooden door and is spray painted with different colors of graffiti. There is a yellow long couch that leans against the aqua blue wall, with 3 chrome tables for bottle service needs. The Studio is on the left side of the Mezzanine Balcony in between to the Blind Tiger, and the 6 VIP Tables, directly across from the Prestige. What is the Mezzanine Balcony Level bar in Jewel Nightclub Las Vegas? This night club in Las Vegas NV features a bar on the Mezzanine Balcony Level that is just to the left of the center of the balcony right behind the dance floor. This long bar creates in addition to the dance floor creates a nice over-sized general admission area in the club. What type lighting, audio, and video does Jewel Nightclub Las Vegas have? This night club in Las Vegas NV features an Aryton lighting system that utilizes 54 moving panels that are located behind the DJ Booth. Master lighting designer Willie Williams installed 1,400 square feet of LED ribbons that have been seamlessly embedded in the walls and above the dance floor. Aryton Digital Lighting equipment was used such as the Aryton DreamPanel Twin™, Aryton CosmoPix-R™, and Aryton MagicDot-R™ fixtures. The oval rings on the ceiling dome are highlighted by ROE Hybrid 15S LED tiles. L-Acoustics was the preferred brand of audio used with L-Acoustics 12XTi and 8XTi cabinets used as fills, and L-Acoustics SB28 subwoofers were used for low end. L-Acoustics LA4 and LA8 were also used to amplify the controllers. There are 2 5-wide L-Acoustics ARCS II arrays on both sides of the DJ booth. The DJ booth is capable is of moving 360 degrees. Ne1co, Avolites & AI team, Audiotek International, and the Hakkasan Group were also involved in the development of the lighting, audio, and video design system. Learn about the Jewel guestlist. 24,000 square foot nightclub located in the Aria Hotel with 5 skybox suites.